Up to 50 billion devices will be connected to the internet by 2020. The digital transformation is reshaping the economy by enabling new ways of interacting with suppliers, partners and customers. At the same time, it is also paving the way for the Circular Economy. As materials and products can be tracked along the supply chain, companies will be able to organize reverse logistics for products at the end of their life cycle, converting this potential waste into a valuable resource. Our innovative software solutions help all players in the circular economy to comply with current requirements and adapt to future needs. At Prodigentia, we know how to transform complexity into simplicity. Our suite of digital solutions is based on long-established expertise in managing waste streams for producers, compliance schemes and waste operators. As a result, we offer a comprehensive solution which can easily be customised according to the different requirements of our customers. We are currently active in more than 20 countries across Europe, as well as in Africa, North and South America & Middle East. Our solutions support the needs of several stakeholders in the Circular Economy from Producer Responsibility Organizations, Regulators, Operators and Recyclers among others. It is built to manage every step in the process from individual producer responsibility (IPR) take-back through to the final recycling of resources that can be fed back into the manufacturing process, closing the loop. Combining our customers’ decades of expertise in the field with our own experience in delivering high performance software, Circul8 orchestrates resources and processes – optimizing the business and providing valuable insights to management. 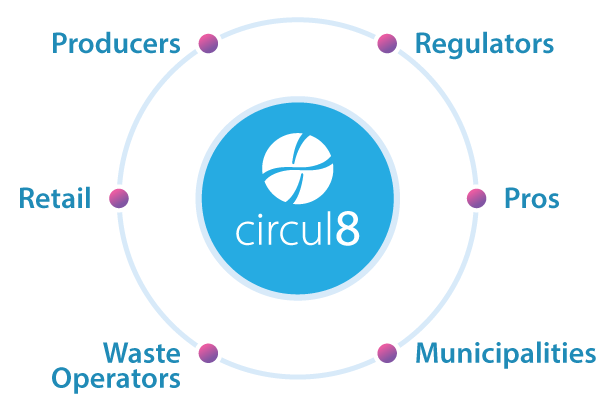 Circul8 manages multiple regulations, languages and currencies and consists of 3 modules. For more information check our dedicated product website. Mission: Reporting to the Head of Production and Delivery, the primary responsibility is to design, manage and co-ordinate multiple ongoing projects to meet agreed business objectives, as well as writing IT documentation (IT guidelines, work instructions, change requests, specifications, etc.). This entails the efficient use of allocated resources to achieve cost, time and quality targets as well as smooth running of the day to day operations. The candidate will be working in Alfragide, Portugal. All IT infrastructure is scattered across 16 European countries. Face to face contact with the users and suppliers is often required. Prodigentia SA is looking for IT Technical Support professionals to provide support to customers for its SaaS ofers. get maximum benefts from them. Please, download the pdf for more. Required skills: Solid Object-Oriented Programming and back-end development experience with Python and Django. Required skills: Solid Object-Oriented Programming and back-end development experience with PHP and MVC. Prodigentia is an IT company dedicated to building best of breed software for the Circular Economy. Founded in 2003, Prodigentia provides software solutions that offer a secure, more effective way of handling compliance activities and waste management operations. Prodigentia’s portfolio includes solutions for PRO’s, manufacturers, regulators and waste operators. Integrate your take-back operations and actors, automating processes easing the management of your assets. Europe is widely reported to have the world’s strictest environmental regulations, which places a significant administrative and financial burden on manufacturers that do business there. In 2002, European Union passed the Waste Electrical and Electronic Equipment (WEEE) Directive, obligating manufacturers to implement take-back programs. Prodigentia has vast experience of producing bespoke applications that satisfy our customers’ needs. We work collaboratively with our customers to deliver software incrementally using agile methods. Continuous feedback allows you to control the direction of the software, ensuring that you get the exact solution you require. Our team has an expansive knowledge of the ever-growing software ecosystem, enabling us to build solutions through the web, mobile and cloud. Deployment and hosting are a large part of bespoke applications and Prodigentia routinely use cloud providers to deliver our software. We’re passionate advocates of continuous delivery and can work with you to help introduce digital transformation into your organization. We can work closely with you to provide recommendations on any aspect of your software development, delivery or training. Not only do we provide you with “quick wins” but also with long term strategic considerations.